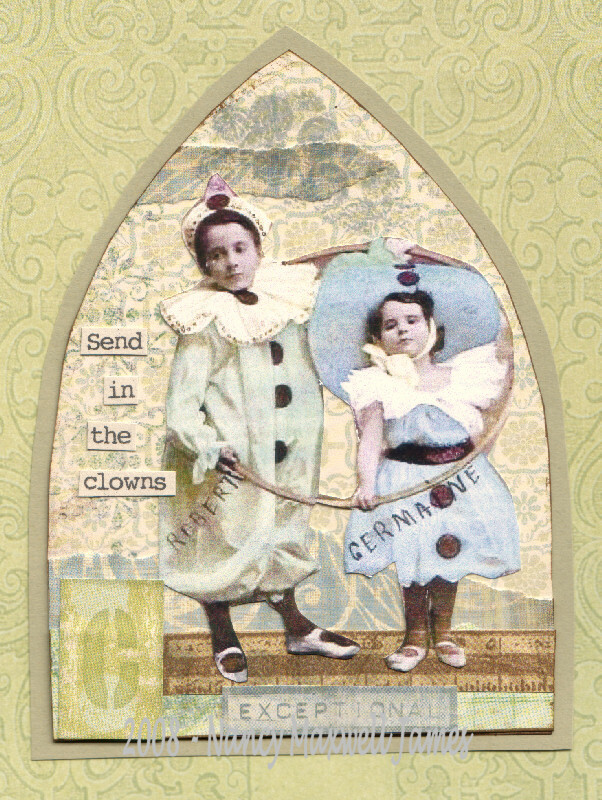 Our theme this week is “Clowns” which was selected by our hostess Nancy Maxwell James. What do you think of when clowns comes to mind? Happy faces? Children? Bozo? Whatever you invision we wish to see it here in gothic style! Nancy is a mixed media artist, stamper and scrapbooker living in Michigan with her husband Steve. She has 3 children, and currently has a son deployed in Iraq. Nancy enjoys working with vintage images in all sorts of media forms. She loves genealogy and enjoys making scrapbook pages documenting her family history. I made two arches for this weeks theme…can’t wait to see what everyone creates! Here is my Clown. Thanks for looking. Thanks for looking and have a nice and sunny sunday ! I missed the challenge last week — glad you are back! I’m devoting my one and only clown image to this week’s challenge. 🙂 See blog for sample – peace. What a great theme! Mine is on my blog…. Sorry to say I totally forgot to check last week’s theme but back this week and I love the theme. This is a great theme, Nancy. I decided to go in a slightly different direction with a tragic clown. My clown is @ my Blog ! What a cracker of a theme this week! Here’s mine! Here is my clown.Thanks for looking! Hi! Nice theme. here is my entry. ‘My entry is on my blog! As one who associates clowns with being scary it sure was wonderful to see so many sweet and fun clown images in all of your arches.